The information and communication technology company makes a contribution to establish the Midis Group Student Computer Center. 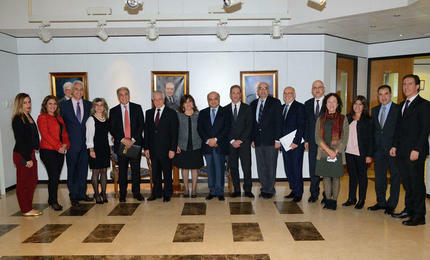 President Jabbra surrounded by several members of the Midis Group team as well as LAU’s Advancement and Development leaders. Midis Group has made a significant contribution to LAU to establish the Midis Group Student Computer Center located at the forthcoming Engineering Labs and Workshops Building on the Byblos campus. Slated to open in fall 2017, the center will offer high-quality computing facilities and services for students, faculty and staff in order to support the teaching, research and educational endeavors of the university’s School of Engineering. Specifically, it will house 35 high-end workstations with a dual-boot operating system, and will provide discipline-specific software and resources to fulfill the unique academic requirements of electrical and computer engineering students. Nicole Barghoud, development director for LAU who helped to facilitate this gift to the university stressed the need for academia and industry to come to together. “Today, more than ever, the only way for any educational institution to stay competitive is to be more creative, more innovative, and faster than the competition,” explained Barghoud. “And in the wake of growing economic challenges due to globalization, there is a need for universities to forge working relationships with the industry in order to be relevant, progressive and to spur a nation’s economic growth,” she concluded. This is not the company’s first vote of confidence for LAU. In April 2014, Midis Group established the Midis Group Annual Scholarship grant to assist needy and deserving students of the School of Engineering, the School of Arts and Sciences and the Adnan Kassar School of Business.